Divorcing a husband you can’t find or a wife you can’t find can be challenging. 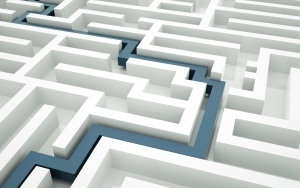 It is a maze that requires you to know where to start before you can get through it. As a Jacksonville divorce lawyer, I sometimes have people that come to our firm wanting a divorce, but he or she has no idea of where the husband or wife is located. In some instances, the spouse he or she desires to divorce is believed to be somewhere in the State of Florida. Jacksonville divorce lawyers can find the average person inside the State of Florida. Even finding someone outside the State and extending the search nationwide is normally doable. However, finding a person suspected of being outside the United States is another question. Starting with a person’s last know address: A person filing a Florida divorce must start with the last know address of his or her spouse. Assuming that the spouse to be served with divorce papers cannot be found at his or her last known address, there must be a diligent search to ensure that he or she receives notice regarding the case. Florida law sets out certain efforts that have to be made when trying to find your spouse in order to serve him or her. Once a diligent search has been completed, you may serve your spouse by publishing notice of the divorce in the local paper in the areas where your spouse may be living. This is called service by publication. It is also referred to as constructive service. Trustify.info suggests eight steps when trying to find a missing person in their article, “How to Find a Missing Person: 8 Critical Steps. This could be helpful in trying to locate your spouse. If the proper diligent search is not performed, service by publication can be invalidated. The reason for this is that “due process” requires that a genuine good-faith attempt is made to give your spouse an opportunity to be heard on the issues surrounding the case. Due process is a major part of justice in the United States and in Florida divorce cases. A Jacksonville family lawyer or jacksonville divorce lawyer can help you make sure that your case moves forward properly. At the Law Office of David M. Goldman, PLLC, our experienced Jacksonville divorce lawyers have dealt with these types of issues and can help guide you. Call us today to schedule a free thirty minute consultation! We will help you find the best solution for you and your circumstances.